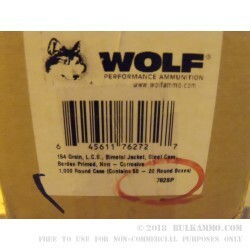 A prime 7.62x39 round for AK-47 or SKS shooters looking to do a little more than just "plink". 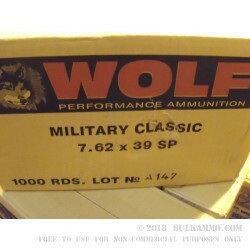 These rounds feature a 154 grain soft point bullet that delivers an advertised 2,100 feet per second of muzzle velocity. The soft point loads have shown excellent results when tested with ballistic gelatin. 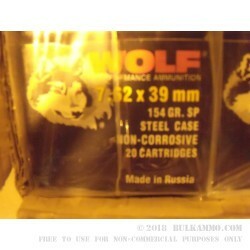 Made by Wolf, these rounds are manufactured in Russia so you know they're speaking the same language as your AK-47. Get a full case of these rounds today and you'll receive 50 individual boxes with each containing 20 cartridges of 7.62x39 ammo ready to fire!